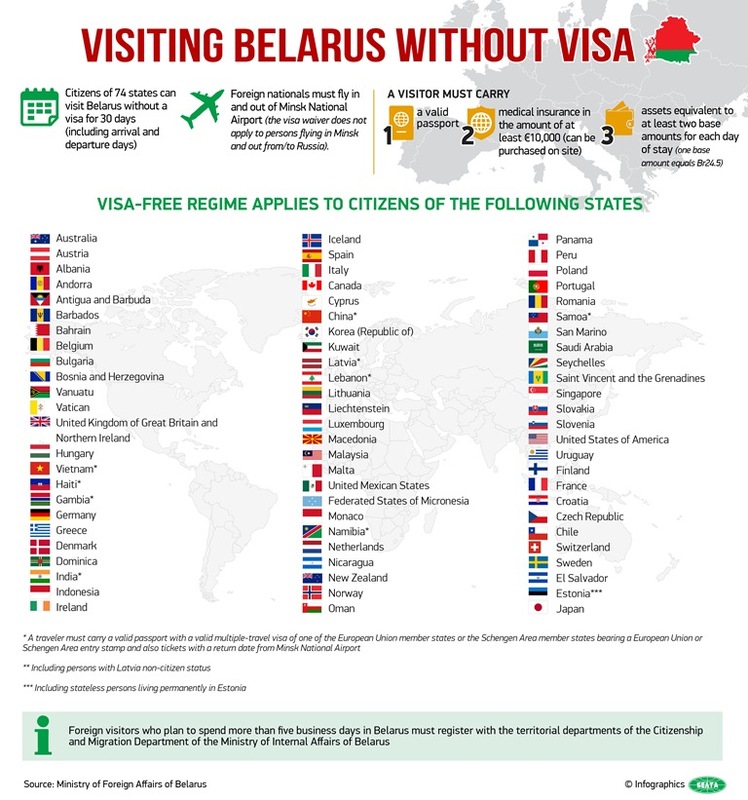 According to the Presidential Decree, effective from July 27, 2018, foreign citizens of 74 countries* can enter Belarus for up to 30 days** and exit from the territory of Belarus only through the State border checkpoint of the Republic of Belarus “Minsk National Airport”. The term of visa-free stay is calculated in calendar days; the first day corresponds to the date of arrival, the last day coincides with the date of departure (regardless of the time of arrival and/or departure). Visa-free regime does not extend to holders of diplomatic, service, special and other passports equivalent to them. The trip is carried out for private, business, tourist or other purposes not related to employment, commercial activity and education, if the term of education exceeds 30 days. - a medical insurance policy with coverage for at least 10 000 euros, valid in Belarus during the whole duration of stay. For citizens of Vietnam, Haiti, Gambia, India, China, Lebanon, Namibia, Samoa a valid multiple visa of the EU member states or Schengen zone with a mark in passport on crossing the border of these states and tickets with confirmation of departure from “Minsk National Airport” within 30 days from the date of entry is a compulsory additional requirement. NB: When staying in Belarus for more than 5 working days, foreign citizens need to register with the divisions on citizenship and migration of the territorial bodies of internal affairs. When staying in hotels, hostels, sanatoriums and other collective accommodation facilities the registration of foreign citizens is carried out by the administrations of such facilities by default upon check-in. The term of visa-free stay can not be extended beyond the established 30 days.